Mary Netta Walker, 98 year old former Woodward resident, passed away Saturday, February 2, 2019 in Tucson, Arizona. Funeral services will be held at 11:00 a.m. Saturday, February 16, 2019 at the First Christian Church in Woodward with Pastor Ronnie Hopkins officiating. Burial will follow in the Freedom Cemetery. 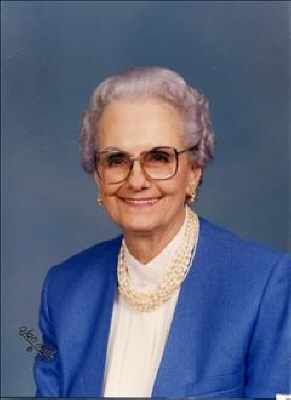 Mary Netta (Wells) Walker was born on November 7, 1920 in Copan, Oklahoma to Lyle Herbert and Geniva (Bowersock) Wells. She grew up in Copan on the Caney River. She graduated from Copan High School. Mary Netta attended Oklahoma State University for one year. While there she met her future husband Gilbert Walker, on a blind date arranged by mutual friends Velden and Ruth Swiggart. Her music degree was completed at Northern Dekalb College in Illinois. On October 2, 1942, she was united in marriage to Gilbert Dixon Walker in Barnsdall, Oklahoma. They made their home in Fairview where they both taught school. After two years at Fairview, the family moved to Freedom, Oklahoma where Mary Netta was in charge of music for all grades. Her programs were major productions that the entire community looked forward too. Mary Netta, Gilbert, Kay, and Travis eventually moved to Woodward, while teaching there Mary Netta began giving piano lessons. She established a studio in her home and taught numerous students of all ages to play the piano. She was a member of the First Christian Church and was the Choir Director for 30 years. Mary Netta was a member of PEO, was a volunteer at the Woodward Hospital as a Pink Lady, the Democratic Party, and the Order of the Eastern Star. She loved music and spending time with her family and students. She is survived by one daughter, Lila Kay Walker; one son, Travis Walker and wife Danita; six grandchildren, Jennifer Andrews and husband Donnie and children, Acacia, Simon, Maranatha and Providince; Lance Walker and wife Jamie and children, Bodie and Reese; Kit Walker and wife Melissa and children, Kaleb, Makenzie, and Jayla; Trav G. Christopher, Carissa Branch and husband Tim and children Andre and Evie; Carlee Otero and husband Michael and children, Kale, Makala, Jacy, and Hudson; nieces, nephews, other relatives and friends. She was preceded in death by her parents, her husband Gilbert Walker on September 4, 2006, and three brothers, Les Wells, Lyle Wells, and Joe Wells. Memorial contributions may be made to the Freedom Ambulance with the funeral home accepting the contributions. To send flowers or a remembrance gift to the family of Mary Netta Walker, please visit our Tribute Store. "Email Address" would like to share the life celebration of Mary Netta Walker. Click on the "link" to go to share a favorite memory or leave a condolence message for the family.